Some background: We're training an AI to learn the difference between happy voices and angry voices. We've had some success, by showing it 200 angry audio clips, 200 happy audio clips, and 200 neutral. It can now reasonably tell when we're talking pleasantly or confrontationally... but the accuracy could be better. Our total training dataset is made up of these audio clips: Happy, angry, neutral, calm, sad, fearful, disgust, and surprised. 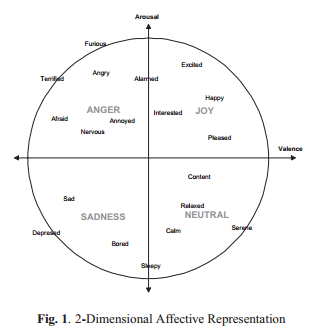 I think we can be more accurate by including these emotions. That's the shape of the data we need to train a neural network to recognize 'Happy'. As I mentioned in the comments, the tool we're using is pyAudioAnalysis. The tool's author, Theodoros Giannakopoulos, also wrote an earlier paper "A dimensional approach to emotion recognition of speech from movies"
It's also worth mentioning, maybe, that this later paper seems to describe all the specific characteristics that pyAudioAnalysis analyzes: "signal energy, entropy of energy, zero crossing rate, spectral centroid, spectral flux, Mel Frequency Cepstral Coefficients, Chroma-based features, etc." Not the answer you're looking for? Browse other questions tagged emotion reference-request neural-network artificial-intelligence or ask your own question. Why do humans/primates laugh/smile when they are happy, and not cry? Why do views make you happy?